Private classes. 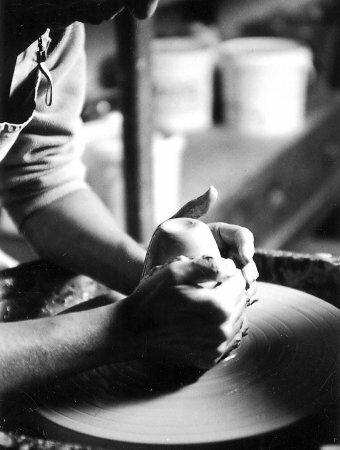 If you're impatient to get your hands into that velvety clay, we can schedule a private two-hour introductory session. A private class also makes an original gift : unleash creativity as a birthday present, encourage friends to discover a new activity to wish them a happy retirement. However, beyond the first introductory session, I am unable to schedule further private classes on a regular basis. The few available spots I have in my agenda are reserved for those students coming from afar to work with me. Introductory classes for groups. You have a group of friends or colleagues who'd like to try their hand on the wheel. Classes can be customized to your desires, with rates depending on the size of the group. And yes... I can tell you that I did organize a bachelorette party at the studio. There was plenty of good music, and each participant gots hands-on experience with the clay's sensuality. Then the bride-to-be got to live out her fantasies from the movie Ghost... but, sorry, that's the part I can't tell !